How to choose the best prescription snorkel mask? How do you snorkel with prescription glasses? 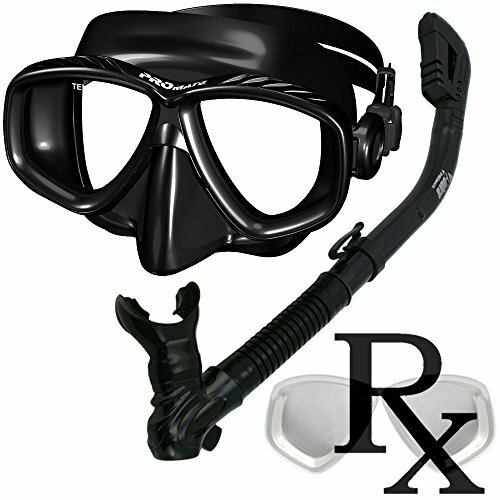 How to Order a Prescription Diving Mask Online? 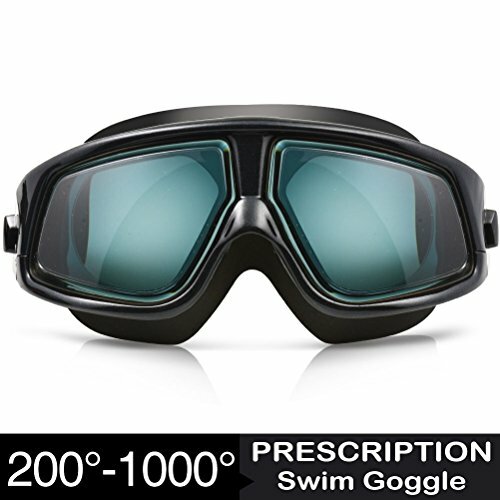 Except for complicated visual problems like astigmatism, the Promate Prescription Dive Mask is designed to be used by divers and snorkelers that needs prescription lenses for vision correction. This diving mask with prescription lenses can address both nearsightedness and farsightedness using an OP250 lens. The lens itself is bi-focal and has two division which is divided by a visible segmented line. The upper portion is made up of tempered glass which is a type of safety glass that can withstand internal stress and has no graded lens. The lower portion is a gauge reader that has a diopter step lens being offered from +1.0, +1.5, +2.0, +2.5, +3.0, +3.5 and +4.0 which is all made up of a OP251 material. In other words, the upper lens is designed for distance vision while the lower lens is designed for looking at objects at a close distance. While there are several visual magnifications being offered in the Promate Prescription Dive Mask, all you need to do before purchasing this product is to share your visual grade and the technician will install the right prescription lens for you. As far as the mask is concerned, it is classified as a low volume mask and has a facial seal of 4.5 x 3 inches (width x height) which is ideal for divers and snorkelers with a medium-sized face. It has a highly elastic strap and the skirt has a double edge seal which are all made up of silicone. The only downside with this best-selling prescription mask is the 0.5 step increment of the diopter step lens where some users may need to round down or increase their visual correction factor. For example: a diver or a snorkeler who has been using a +3.25 diopter step lens may need to round down to +3.0 or increase to +3.5 as this are the only available increments. The Promate Prescription Purge Mask is designed to be used for divers and snorkelers who are nearsighted ranging from -1.0 to -10.0 and those who are farsighted ranging from +1.0 to +4.0 all using a diopter step lens. 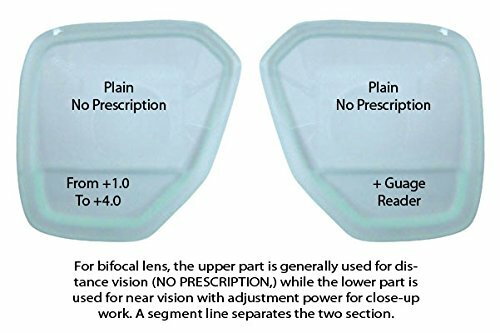 You need to be aware that, the same with the previously described Promate Prescription Mask, the Promate Prescription Purge Mask is only offered with 0.5 increments and that you need to round down or increase your optical mask prescription grade in case you fall in between the specified figures. The good thing with this prescription mask is that it is fully designed to give you a clear view of the surroundings courtesy from its purge features. While water may come inside the mask once in a while, getting it out would require you less effort during a mask clearing since water will exit at the purge valve located at the lower skirt of the mask. This in turn will prevent water from obstructing your vision as compared to non-purge mask where the water will splash and scatter once you perform mask clearing. Aside from the purge valve, the mask itself features low volume with a slim fit. It has a channel at the bottom of the silicone skirt which directs both bubbles and water away from your direct view. The straps and buckles can easily be adjusted courtesy from its multi-directional swivel. It also comes with the Promate Cobra Snorkel which features a purge valve system that makes water clearing so easy. Some users who have used the Promate Prescription scuba diving mask for the first time told us that fogging and misting persist. With this, we highly recommend that you spray some commercial defog on the lens to prevent this undesirable visual discomfort. 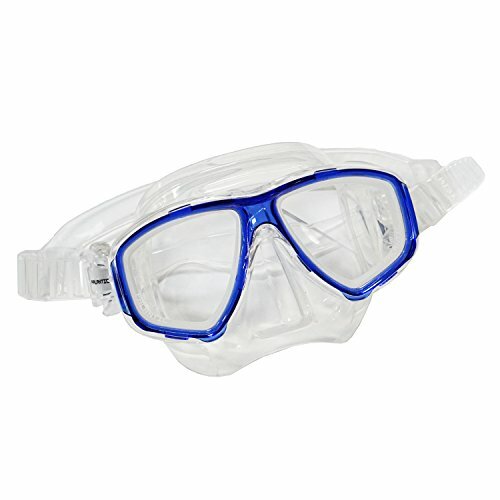 At a first glance, the Scuba Choice Blue Diving Prescription Mask just looks like your ordinary diving mask. But if you take a closer look especially at the lens, you will realize that this is a prescription diving mask. And not just any prescription mask, this one is specially designed for nearsighted users. It uses a diopter step lens with several choices of correction factors ranging from -1.0 up to -6.0. The components of the mask is composed of a highly transparent silicone that gives you all over-all bright view of the surroundings. Its silicone-base strap is highly flexible yet strong enough giving you a nice head placement. Just in case the strap is dislodged from the assembly, you can easily place it back and quickly adjust according to your preferred tightness courtesy from its unique buckle design. 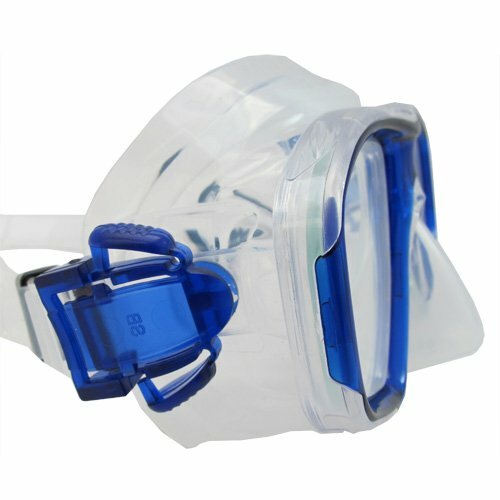 If you just bought your Scuba Choice Blue Diving Prescription Mask and try to fit it while on land, you will observe that things are slightly blurred. But this does not mean that you got the wrong prescription lens. Once you go underwater, you will observe that objects will come out clear as the water tends to correct the magnification in a slight degree. This is the reason why most of the users of this particular perscription mask tends to purchase a weaker prescription lens. For example, if you are comfortably using -3.0, then what you should use is a mask that has a -2.5 lens. And one more thing, while it is a fact that most kids are nearsighted, we are sad to say that the Scuba Choice Blue Diving Prescription Mask has not yet manufactured scuba frames that will fit a child’s face or any facial contour that can be considered relatively small. Sometimes, using a mask that is made up of a fine clear silicone may cause too much illumination that it will come to a point that you will be dazzled especially on a hot sunny day. This is the reason why some may opt to use a black colored silicone material to optimize brightness where you can have a better focus on the subject. And one of the black colored silicone mask with a corrective lens available in the market is the Scuba Choice Black Perscription Mask. This eyewear is designed to be used for nearsighted snorkelers and divers with a wider range of optical prescription ranging from -1.0 to -10.0 with 0.5 increments. Since the Scuba Choice Black Prescription Mask has one of the highest diopter lens rating, many have considered this an efficient mask even if one suffers minor astigmatism. For example, one user who has been diagnosed with a minor astigmatism and at the same time is extremely nearsighted, shared to us that everything was clear while underwater when he used this particular mask with a -9.0 factor. There are some misconceptions about using prescription mask where a common wrongdoing is the non-application of an anti-fogging agent such as commercial defog or as simple as toothpaste. You have to remember that prescription mask that uses the drop-in type of lens integration needs to be defog once in a while as the visual mechanism it uses is pretty much similar to a regular mask. It can withstand soft chemicals from the commercial defog or from the toothpaste and applying a small amount on the lens before snorkeling or diving would significantly reduced fogging or misting incidents. Just don’t forget to rinse the toothpaste before using it. The IST Optical Corrective Mask is a broad range prescription mask that is designed for use by snorkelers and divers who either nearsighted or farsighted. As far as the lens selection is concerned, it uses a diopter step lens that has a long range of optical factor from -8.0 (for nearsighted) up to +4.0 (for farsighted). All you need to do is just tell the manufacturer your prescribed optical grading and they will be very glad to assemble and integrate the lens for you. Once you receive it, it is ready for use. When it comes to mask components, the IST Optical Corrective Mask is not just designed to take care of your eyes, but also your skin. Its skirt are made out of hypoallergenic silicone which is very gentle to most skin types without suffering any allergic reaction. The mask straps are designed to be widely split which will give you a nice fit without suffering any head or mask squeeze which can become painful especially after the dive. This is further complemented with its swiveling buckles that can be rotated and adjusted according to your preferred angle strap. The only downside we see with the IST Optical Mask is that it only comes in a single size. Given the fact that it can fit most facial contours and profiles, the mask is suited to be used with a narrow shape face. COMFORTABLE WEAR - Split silicone strap ensures a snug fit while preventing painful squeezing. TEMPERED GLASS - Impact-resistant lenses are safe and durable. 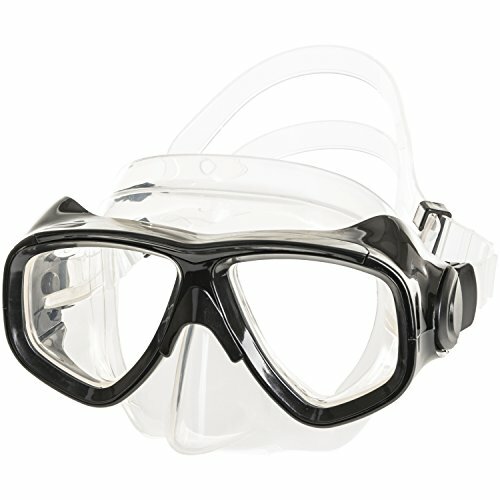 Full face snorkel masks are fast gaining its popularity nowadays, and so does its prescription version. 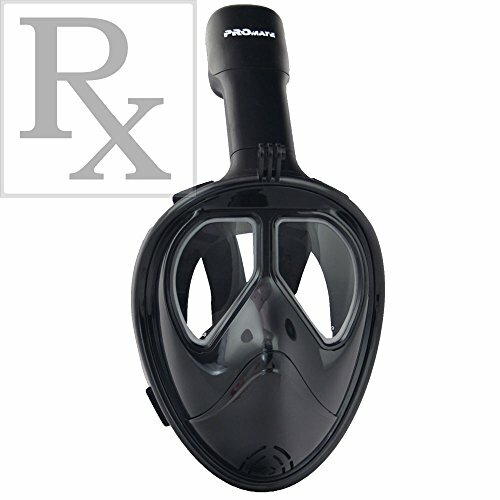 The Promate Prescription full face snorkel mask is designed specifically for nearsighted snorkelers where you can choose a lens grading from -1.5 to -6.0 with a 0.5 increment in between. When compared to a typical mask, a full face snorkel mask allows you to breathe either from the nose, mouth or both. Instead of a snorkel which is a standalone accessory for masks, the full face snorkel mask has an integrated front mounted snorkel that is built within the mask itself. So there is no need for you to adjust or install the snorkel before you proceed to your favorite snorkeling site. It has a thick skirt which can give you a total seal against water making the inside totally dry even if you opt to go underwater. 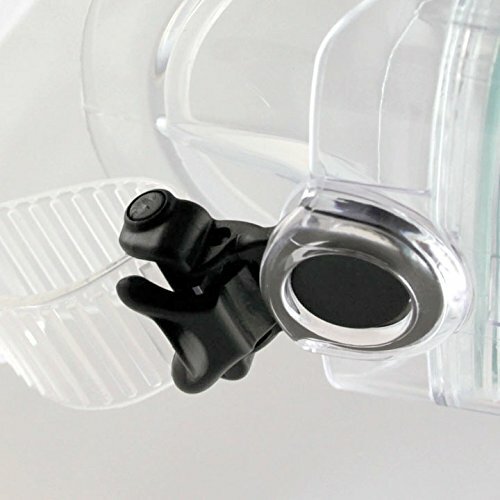 The total seal feature of the Promate Full Face Prescription Mask is considered a “Physical Anti-Fog” feature as water is prevented from entering while the warm air you just exhaled will be directed to the integrated snorkeling pipes at the side, instead of getting in direct contact with the lens itself. While some of the previously mentioned prescription mask limits it usage to adults, the Promate Full Face Prescription Mask can be used by both adults and teenagers. This is due to the fact that the size of the full face mask is offered in different sizes ranging from small to large. For sizing reference, a large size full face mask can snugly fit to a face having a size of 12 centimeters (4.7 inches). And in case you are in to sports camera, you should appreciate this full face mask as it has a mounting on the top where you can easily attach your compact sports camera and document your underwater adventures while being hands-free. Have you observed that when we use your eyeglasses, we tend to incline it to a certain degree. We do it unconsciously until it will come to a point that we are used to it. This is where the problem comes when we wear prescription mask as there is no such thing as an inclined mask. However, this problem has the challenge the designers of an Italian scuba gear manufacturer that they decided to have a tempered glass installed in an inclined position, which they patented later on under Patent No. US6272693.. The Cressi Focus Dive Mask with Inclined Lens is the first of its kind where you don’t need to elevate the position of your head in order to read something that is small or focus on a small object. But take note that the lens that are pre-installed in the mask are not prescription lens. However, it can be installed with one according to your specified optical rating. Its low volume mask that has a twin lens design is considered to be one of the most versatile mask that can fit most types of facial contours and shapes. Speaking of low volume and inclined lenses, these two features is complimenting each other where the result gives you a clear view of your surrounding as both of your eyes are positioned near the lens which is pretty similar in wearing an eyewear. The mask is lightweight and compact that is made from a soft and hypoallergenic silicone. The skirt has a double feathered edge that provides an excellent facial seal. 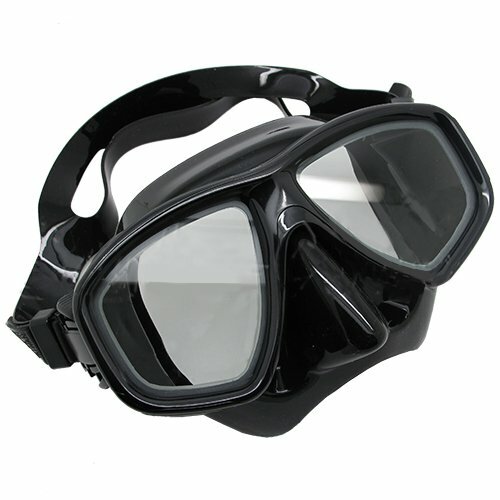 One of the first dive mask with inclined glasses, a patented technology of Cressi (US6272693). 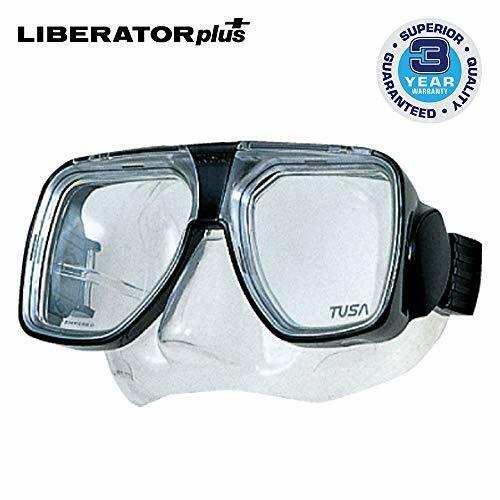 If there is one model and brand of prescription scuba mask that is most copied, then nothing beats the Tusa Liberator Plus Mask. It has been copied but its duplication has never reached perfection. And why is this so? It’s due to its features that are relatively simple yet functional. This low volume mask features a 2-window lens that is encased in a smooth yet durable frame with a hypoallergenic twin feathered skirt that is gentle to the skin of our face. It has a highly elastic strap yet durable enough to give you a snuggle fit and stays in place even when it comes in contact with waves. As for the pre-installed lens, they are made from tempered glass and has the upgrade features where you can fit it with a corrective lens (MC-5000) that is sold separately. While the Tusa Liberator Plus Mask is a product of innovation from older models, such as the Tusa Liberator and the Tusa Imprex, the corrective lens that will be fitted in this particular prescription mask can also fit other models of Tusa mask. Now, here’s a thing about men using prescription mask. It’s not about their vision. It has something to do with some men having a moustache where the extended hair above the lips may interfere with the seal of the skirt. According to one of the many users of the Tusa Liberator Plus Mask claimed that the 2-feathered seal of the skirt perfectly tucks in his moustache and no water came in. 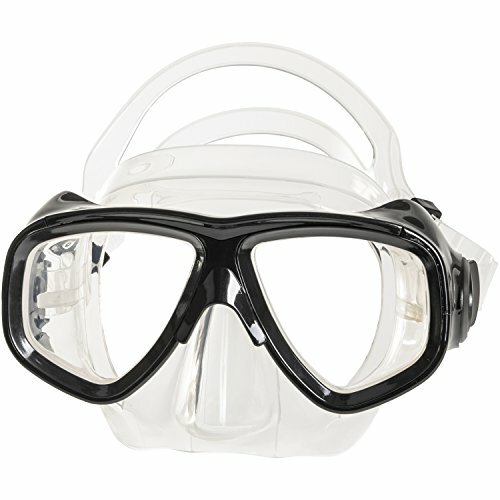 Most of us may have our own diving or snorkeling mask where we are already accustomed to its comfort and fit features. But what if you need to use prescription lenses, do you need a new mask? No need to buy one as you can buy only the prescription lens as an added standalone accessory, like the Tusa Corrective Lens. 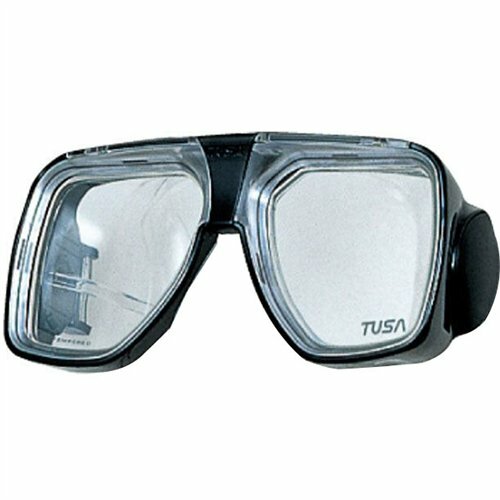 But word of caution: this corrective lens would only fit the previously mentioned Tusa Liberator Plus Mask and its lower version like the Tusa Liberator and the Tusa Imprex. It may not fit to other brands and models of diving mask and snorkeling masks. This accessory package comes with the left and right corrective lens where you can choose from a wide gradings of diopter step lens ranging from -1.5 to -8.0. The graded classification of corrective lens would tell you that this is designed for use with nearsightedness. Another word of caution: many have personally attempted to change and install the corrective lens on their mask which often ends up in a damaged eyewear. We highly suggest that you visit a dive shop or a qualified technician and allow them to properly install the corrective lens. Some of us may opt to use an ultra-low volume swim mask, which in this case, you’re best option is to wear swimming goggles. But have you ever heard of a pair of goggles with prescription lenses? Now you know and we are introducing to you the Zionor Prescription Goggles. As far as optical correction factor is concerned, this prescription goggles offers a wide range of diopter step lens from -2.0 up to -10.0 with a 0.5 increment. This means that nearsighted snorkelers would love this piece of equipment. Again, we reiterate: only snorkelers and not scuba divers as this piece has no nose pocket (so it is not a prescription swim mask) which is deemed important when you go scuba diving while performing the mask clearing or mask recovery skill. The lens of this prescription goggles are tinted which many have appreciated its reduced light on a bright sunny day and not being dazzled. Just do not forget to place back the underwater goggles to its casing after use as the tint can easily be scratch and may affect the quality of your underwater vision. Promate optical corrective snorkel mask is great if you do not want to wear corrective lenses while snorkeling or diving. Comes in +1.0 to +4.0 by increments of 0.5./OP250 and optimal for medium faces. Low volume and silicon skirting for a great seal. Available in lots of colors! 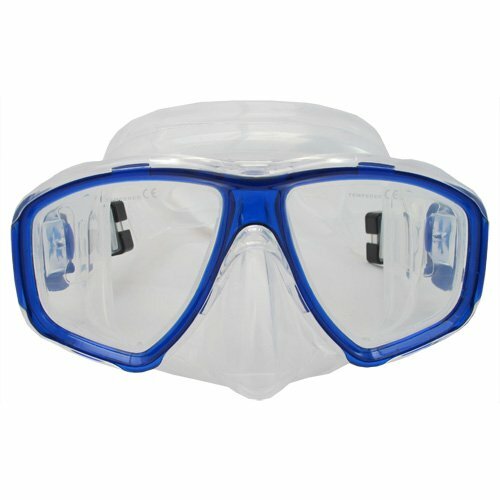 Scuba Choice nearsighted snorkeling mask comes in -1.0 to -10.0 available in half sizes and can do 2 different lenses but non refundable if specifically made. Unique adjustable straps for easy fitting and only comes in black. Scuba Choice nearsighted snorkle mask is available from -1.0 to -10.0. The clear mask offers zero obstruction for sight making for a great mask. All silicone and tempered individual glass lenses make it comfortable on your face. Deep Blue Gear prescription mask has +4.0 to -10.0 in lens strength so you have a wide range to choose from and you can mix and match if your eyes are different depths. Make sure it is correct because you cannot return specialized mask orders. Lots of colors to choose from! 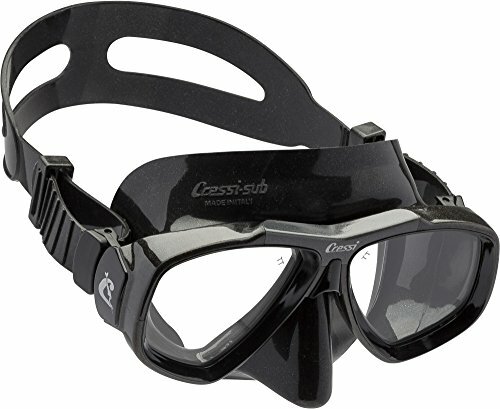 Cressi snorkel mask (prescription lens' sold separately!) If your not sure prescription snorkeling goggles are for you but you don't want to buy really a mask and find out it doesn't work for you. This is perfect because you can switch lens quite easily. Below are the corrective lens to attach. ONLY LENS! Cressi Focus lens available from -1.0 to -8.0. Easy to change good option if your not sure on prescription snorkeling masks so you don't have to let it collect dust if you don't use it. Switch the lenses and away you go! Camouflage Scuba Choice nearsighted prescription mask has -1.0 to -10.0 in .5 increments. Blend in with the sea with your own camo mask. Silk skirting and easy adjustable straps! I bet you will be the only one blending in with the sea! Promate Deluxe snorkeling gear has a prescription mask Nearsight from -1.0 to -8.5 by increments of 0.5; for Farsight, from +1.0 to +4.0 by increments of 0.5 so there is lots of options PLUS open heeled fins and snorkel with splash guard and purge drain. Phenomenal deal for the whole package! Prescription Lens Integration - without a prescription lens, your mask is just an ordinary mask. Designers and manufacturers have come up with a solution on how to integrate the prescription lens to the mask. Bonded Lens is the old and traditional way of addressing corrective vision. Your prescribed corrective lens will just be glued to the internal glass of the mask. But make no mistake of taking off the lens of your reading glasses and stick it to your mask. You have to take note this corrective bonded lens has a flat surface (and not round) that can easily be secured inside your mask. Also called as “Off the Shelf Lens”, the Drop-in Lens is a simpler and less expensive option you can choose. The mask itself is designed to be used with “off the shelf” corrective lens. Meaning, you buy your preferred mask and the dive shop will replace the glass with a prescription lens that suits your visual correction needs. What most snorkelers and divers do if they choose this type of lens integration is they choose their preferred mask, share their corrective lens specification and the dive shop will install and deliver it to you ready for use. Many have claimed that the drop-in type of lens integration is far more effective when in it comes to distance correction and this is important since we know underwater vision involves a 25% refraction factor. In case you forget this, it simply means everything you see underwater is 25% larger and nearer and you have to compensate for this. Another type of lens integration is the Bi-focal lens. Most probably, you have seen this type of prescription mask where the upper portion of the lens is made up of tempered glass while the lower part is similar to a reading glass. Many have appreciated this type of lens integration as they can clearly read their instruments and many have claimed that the experience is like reading the small letters of a newspaper. Nearsighted or Farsighted - regardless of what type of lens integration you choose, the effectiveness of your underwater vision will really depend on the compatibility of the lens to the specification of corrective vision. If you are nearsighted (which means you can clearly see an object only if they are close to the eyes), then we highly recommend the use of a negative sphere prescription lens. If you are a nearsighted snorkeler and diver, we have to caution you though that using negative sphere prescription lens would not resolve problems associated with extreme nearsightedness like astigmatism. On the other hand, positive sphere prescription lens are fitted for farsighted users. However, while it may resolve visual problems associated with astigmatism, many have experienced headache and migraine after prolonged use and especially if you choose to use a high corrective lens. 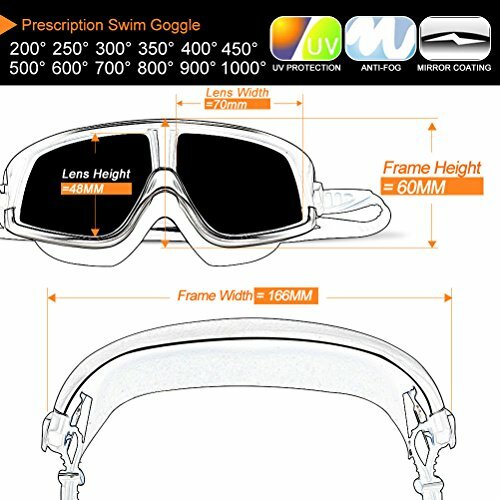 In terms of prescription lens for diving and snorkeling mask, their unit of measurement is expressed in diopter step lens which usually has an increment of 0.5. So it is very important to know if your chosen prescription mask has the prescribed correction lenses that is right for eyes. If it is your first time reading prescription snorkel mask reviews, we highly recommend that you fit your mask first on dry land to get acquainted with the construction and visual restriction brought about by wearing a mask. You have to take note that there is a big difference in using your everyday eyeglasses when compared to wearing a prescription mask (like snorkeling with glasses or contacts). It would be better if you try using it first in a pool just to have a feel of wearing one before going to your favorite snorkeling spot. While snorkeling, one of the first thing that you will notice when wearing a prescription mask is the presence of mist or fog in the lens. Unlike eyeglasses where you can easily wipe it with a piece of cloth, you cannot do this demisting or de-fogging technique while on water. Instead, you need to perform the skill called mask clearing. Just in case you do not know this skill, you simply open a small portion on the top part of your mask allowing a small amount of water to come in where it will draw out the mist once it comes in contact and a simple blow of air through the nose would be sufficient enough to let the water out of the mask. You can also use a liquid defogging agent to prevent the onset of mist or fog. But do not do, as what most scuba mask reviews recommend, the placing of heat near lens to melt the film cover that causes fog or mist. All prescription lens do not have this protective coat, otherwise by doing so, can directly damage the lens. Let us say that you are already acquainted with using a prescription mask on surface water and ready to descend and explore the beauty of the depths. But before doing so, you have to take a good look with reference from the surface to your target point. You may ask the following question: How deep is the reef? Are my depth estimates considerable and within the range with consideration to the 25% refraction factor? Do i have a clear view of my descent and ascent direction? Are there any obstructions? You have to consider these questions especially when snorkeling with a prescription mask and the type of lens you are using. For example if you are using a Bi-focal lens: at surface, focusing on the upper lens allows you to have a clear and general view of surrounding while the lower lens would give you a slightly blurred vision. But as you descent and swim near the reef (please remember to use reef safe sunscreen if you are snorkeling or diving near coral reefs), you can shift your focus to the lower part of the lens where you can have a clear and close look at the reef residents and going back to focus to the upper lens during ascent would give you a panoramic view of surface. Just a reminder, for an optimum time underwater, do not forget to hyperventilate before any descent as this will fill and stock your lungs with oxygen. You can accomplish this by inhaling and exhaling air on a long gasp from the snorkel three times. Remember: No more, no less. Only three times, otherwise you will suffer from over or underventilation which can significantly reduce the amount of time you can hold your breath while underwater. And lastly, with regards to the correct positioning of the snorkel, it should always be secured on the left side of the prescription mask. In this way, you are preparing yourself to extend your bottom time by using SCUBA as the breathing regulators are positioned on the right side and you don’t want your snorkel and regulator to be entangled. So in short underwater vision is ultimately important when you go snorkeling or scuba diving. Otherwise, having a blurred sight is just like closing your eyes while getting wet and not able to clearly and safely see the beauty of the underwater world. So you wear glasses and don’t like contacts (in other words you are dreaming of a snorkel mask for glasses)? As explained above this is not a problem anymore. There is a variety of options for people who don’t like wearing contact lenses while diving or at the very least need extra vision as they snorkel. Even though the best snorkle masks have come a long way with technology and new tempered glass lenses, you sometimes need that extra bit to see better in the water. You will notice that all snorkel lenses come in two pieces so if you were used to a single lens, you will have change things up slightly. At first you may notice a difference but the main component will be that everything is clearer now so hopefully you won’t have to worry about the single lens as an issue. When first looking at corrective lenses, it is not only about the prescription lens… you need to remember that even if the lens is far better; you still need a good mask with all of the components. Make sure the skirting is silicone and not PVC. There is a big difference in regards to seal and comfort around the face. PVC is a cheaper product that can wear out faster along with cracking and letting water into your mask. 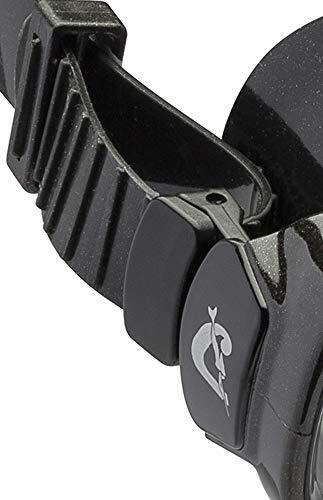 Make sure the strap and quick release clips are of good quality and can actually hold the strap in a proper place opposed to once you’re in the water or even moving around on land the release clips don’t “accidentally” release. You should find this with all snorkel mask reviews in our website. When ordering a snorkel mask online, make sure it includes corrective lenses. Sometimes you can get the same mask with or without corrective lenses and you don’t want to order the wrong mask with not the correct lenses. Depending on your prescription, you need to know that the lens won’t match exactly but it will be close. Lenses usually come in increments of whole or half numbers such as -2.0 and -5.5. So if your prescription is -5.25 you will have to decide up or down. +1.0 to +4.0 with increments of -0.5 for far sighted/OP250. You can also get different sizes for each eye. If you need that specificity, make sure you are correct because if you get the wrong ones, most companies do not allow for refunds when you specifically tailor the mask that way. Some companies don’t offer such a range and usually you will only get up to -10.0 and no more positive than +4.0 so you may have to keep searching and I will provide different options such as the Promate mask. If your mask is good and possibly expensive and you are looking to replace your lenses , make sure you know how to replace them so they seal properly and you are not wasting time and money on new products. I will provide a video to show how to change your lenses but again, air on the side of caution and test them out in a pool or bring an extra pair to the beach just in case. As we have talked before about cost effectiveness remember more money does not always mean better and if you know you only snorkel a few times a year, is it really worth buying the best most expensive mask on the market? If you want to, I mean go for it but for those of you who are economically thrifty I will provide numerous options that will hopefully help you pick the right product that will serve you best. When we talk about is it really worth it, think about how much actually are going to use it. If you have just started start with a cheaper mask and if you find you are using it more frequently and getting out in to the water then you can always upgrade. If you live nowhere near any water but hope to get out think if it is worth it? But if you live in Key ﻿Wes﻿﻿t it is definitely worth getting a good set! On the other hand if you have just moved to or near the ocean or beach and you know it will be a good long investment you will want to upgrade your mask so it does last long. Getting better lenses, skirting, and strap with a solid set of buckles. You can always get different snorkel gear sets for an all in one and also time effective because you know you will get the right product. Since we eliminated the question - can you snorkel with glasses - at the end of the day, it does not mean that while there are prescription snorkel masks available in the market, a visit and check-up by an optometrist is no longer needed. You still need your eyes examined by a doctor and be guided with the right visual correction. Further, selecting the right prescription diving mask for you is a double challenge. Aside from having the right prescription lens, you will need to select the right mask that fits the contours of your face. But if you address that challenge, you will be rewarded with a nice and clear view of the reef that is often categorized as a relaxing experience . . . . .without headache and migraine.